You treat your cat like family, and Chewy makes it easy by offering all of your favorite cat food, cat treats and cat supplies delivered right to your front door. If you've been searching for furniture style cat crates, look no further. Among the wide selection we carry, one option to try is Mr. Herzher's Original Wicker Pet Residence, Dark Brown. Key benefit: flow through ventilation creates a great come and-go pet den. 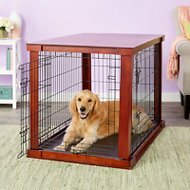 Another product is Merry Products Wooden Decorative Dog and Cat Crate, Mahogany. 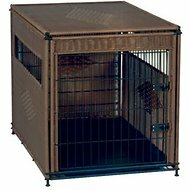 Key benefit: features removable plastic tray for easy clean up and detachable divider for multiple pets. For everything your feline needs, Chewy has you covered. From catnip to cat wand toys, you'll find it all! 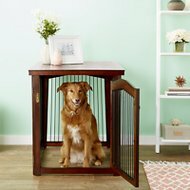 For all your pet needs including furniture style cat crates, Chewy has you covered! We're here for you.